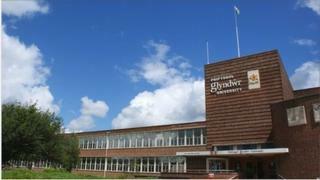 Glyndwr University has been suspended from recruiting overseas students after a Home Office investigation into alleged visa fraud. Nearly 50,000 immigrants may have obtained English language certificates in the UK, despite not being able to speak it. Wrexham-based Glyndwr, one of the institutions identified, has lost its right to sponsor foreign students. The university said it was "deeply upset" by the suspension. Immigration Minister James Brokenshire told the House of Commons an inquiry into abuse of the student visa system found evidence of criminal activity. English language certificates are required for a UK student visa, and the probe followed a BBC Panorama investigation. Of the 48,000 certificates concerned, 29,000 were invalid, 19,000 were "questionable" and Mr Brokenshire admitted it was "likely that the true totals will be higher". Officers uncovered evidence of "serious concern" at some campuses, and the UK government has downgraded Glyndwr University from its status as a "highly-trusted sponsor" of student visas. In addition, 57 private further education colleges had their licences for admitting foreign students suspended. Roughly 3,040 of Glyndwr's 8,800 students are from overseas (non-EU). The Home Office said concerns centred primarily "but not exclusively" on its London campus, where 2,050 overseas students study. About 680 overseas students are in Wrexham, but Glyndwr also has campuses at St Asaph in Denbighshire, and Northop and Broughton in Flintshire. There are 230 Glyndwr-sponsored students with invalid language test results, which rises to 350 when questionable results are included. The Home Office said existing Glyndwr overseas students could continue studies during the suspension. Those with a visa, but yet to travel, are advised to wait until after the suspension. The university said it was "deeply upset," an investigation was under way and it hopes to get the licence re-instated. It added: "To be put in this position by external partners is frustrating as Glyndwr University takes its responsibility as a highly trusted sponsor very seriously and is committed to supporting the continuing education of those genuine international students who demonstrate full compliance with their immigration requirements." Beth Button, president of the National Union of Students Wales, said: "This action could have grave and irreversible consequences for thousands of students studying at Glyndwr University, through no fault of their own." The union said it was "outraged that this news was first announced in the House of Commons", with students made aware afterwards. Labour's shadow Home Office minister, David Hanson, said it amounted to "systematic abuse on this government's watch". Aled Roberts AM, the Welsh Liberal Democrat's education spokesman, said: "I'm worried about the effect this announcement could have on Glyndwr University's attempts to improve their financial footing." Immigration minister Mr Brokenshire told the Commons the revelations followed an investigation into the European subsidiary of an American firm called Educational Testing Services (ETS). The "systematic cheating" typically involved invigilators supplying or reading out answers to rooms of gangs of imposters being allowed to step into the exam candidates' places to sit the test, he said.